The relationship between semiotics and art has always fascinated me. Talk to a museum director about the semiotics of art and there’s a chance you might get a sneer. Too eager to reach for the gun of “meaning”: “Art isn’t always about what it means”. Talk to a semiotician about the art of semiotics and there’s a chance you’ll get a sneer again. “it’s more science than it’s art, there’s a methodological approach”. Don’t get me wrong. The museum director has an interest in semiotics and has read up on it. The semiotician has an even more pronounced interest in art, having found that nearly all semiotic thinkers (s)he studied, at some point, tackled the ‘semiotics of art’. So there’s already that: the preposition used already conjures up a judgement of perspective. Semiotics in art, of art. What fascinates me even more though is semiotics as art. Numerous artists have done it. The best known in both spheres, as far as I can tell, is Joseph Kosuth. American conceptual artist, thinker & writer who brought us ‘One and three chairs’ in 1965. He was just 20 at the time. I’m quite certain you know it, have seen pictures of it or perhaps seen it live. 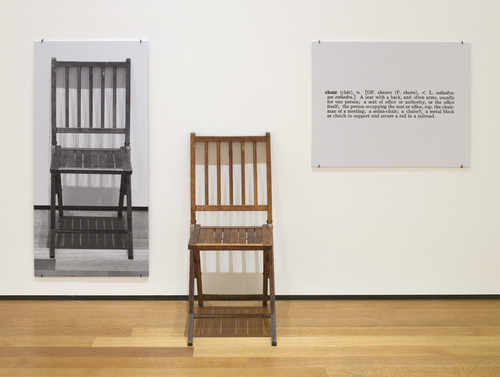 The work presents itself in a threefold, with a life-size photograph of a chair, the actual chair in the same spot as it was photographed in and a blown-up photograph of a dictionary definition of the word ‘chair’. Admittedly I’m guilty of having used it in the past to explain what semiotics is all about. There are worse examples to explain signifié/signifiant/ référent with, but is there more to it? Well, for one: it makes me smile. Kosuth investigates what it means to make art, to experience art, to think about art, to see it as a global model for language and culture. If you substitute the word ‘art’ in most of his writings by ‘sign’ you’ll find yourself reading a text on semiotics. Which for semioticians might not be such a revelation, but remember stating the obvious is always a retrospective action. For me, Kosuth is the perfect answer to any museum director that wants to deny the meaning or function of art, even if the latter does it in jest. And, although, I’ve not come across a quote or text where Kosuth refers to his practice as a semiotic one I cannot see any difference in his investigations. Can you? (Another article, Semiotics As Art: Paul Ryan’s relational circuit & Threeing will follow in the near future). Hello. Thanks so much for this post. Old by now. I’m trying to track down the specific instruction (or even a jpeg of the document) for One and Three Chairs. I looked at the Siegel you cite, which is available via Google Books, but I can’t find it. I’m particularly interested in your claim above that Kosuth supplied the definition. There are many versions of One and Three Chairs, and it appears to me that the definitions are different in every case. Sorry for the broken UbuWeb link. When going to UbuWeb now (July.3.2012) you get the following message:”UbuWeb’s Media Servers Are Down We’re on a break until they come back up.” I’m guessing they’ll be back after summer break.